Home→Heartworm Disease News→Get the Information You Need on Heartworm Right Here! Get the Information You Need on Heartworm Right Here! If you have a dog affected by heartworm, this is the site where we try to provide you with all the information you need. Learn how the disease is spread, prevention, the symptoms, Immiticide and possible side effects, after care and latest news on the disease and treatment. Find all the information you need – in one place! We also provide information on other aspects of dog health – so please use the sit index (you’ll find the link in the sidebar, top right) to browse a full list of articles – or use the search box to find the information you are looking for. We hope you find the information on the site useful, please help us to publicise it by using the share buttons, in particular, the Facebook, Twitter and Google+1 buttons, we really appreciate your support – using these will really help us get more visitors to the site and spread the word! Has Your Dog Tested Heartworm Positive? If your dog has tested positive for heart worm and you are facing the prospect of heartworm treatment, this article sets out to explain exactly what is involved for you and your dog. The most effective treatment for a dog infected with heartworms is to inject an arsenic-based drug called Immiticide. This currently is the only medicine proven effective in killing the adult parasites lodged in the dog’s heart. Dirofilaria immitis is the parasitic roundworm that causes heart worms in dogs and other animals. The larvae are passed from mosquitoes to dogs. 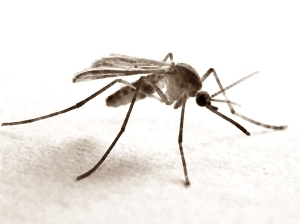 States with a tropical or humid climate are breeding grounds for mosquitoes. Heartworms are prevalent in these states. However, heartworm disease has now spread through all 50 states. Immiticide is the only drug licenced by the FDA for the treatment of dogs who are infected with adult heart worms. The drug is injected in two sites in the hip area. The injection site will swell and will cause your dog discomfort. The first few days after injection, your dog may be lethargic and may have trouble walking. It is critical to avoid touching the injection site, as it is very painful for the dog. You may want to place your dog’s bed close to the door, so your dog will not have to walk far to go outside. The Immiticide will kill any adult worms that have taken up residence in your dog’s heart. After the first injection, the following four to six weeks are particularly stressful for the dog and owner. The dog must be prevented from playing, running or getting excited. The dead worms are destroyed by the process of phagocytosis by phagocyte cells in the body. The dead worms are expelled from the heart in small pieces. If a dog becomes too excited, the heart will pump harder and faster. 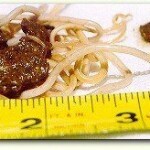 Expelling the heartworms too rapidly may cause the dead worms to travel to the lungs. This can cause respiratory failure. 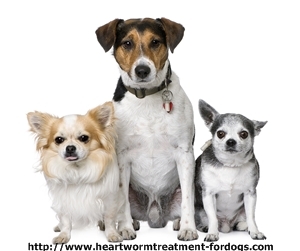 The second stage of heartworm treatment is to kill the worm larvae in the dog’s bloodstream. These are immature heart worms that if left untreated will lodge in the heart and grow into adults, causing serious damage to internal organs. At this point, your veterinarian may allow you to increase your dog’s physical activity to light playing. However, after the second injection, your dog may not feel well for the first few days. 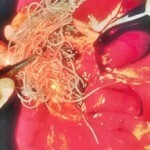 In advance stages of heartworm, surgery may be required to remove the adult worms. This is an option most veterinarians prefer to avoid. However, if the mass of heart worms is too large, killing them with Immiticide may pose a greater risk. Please take a look at the video at the foot of the page but please be aware that this shows an actual operation on a dog having the worms removed. Choosing a homeopathic or “natural” heartworm treatment for dogs may not be as effective as conventional treatments. It is best to consult your veterinarian for advice. Unfortunately, these natural treatments are not proven effective with scientific testing methods (please see our article on this subject). Currently, arsenic-based drugs are the only drug effective in killing adult heartworms. There are drugs that are capable of killing the larvae and a variety of preventative medicines that can avoid your dog becoming infected. Please refer to the articles in our Heartworm preventatives section for more information on how to protect your dog. Prevention is best and most cost effective method. Heartworm treatment for dogs infected with adult worms will costs hundreds of dollars. thank you for the information. I have two questions:1: The antigen test, does it ever give false positive results? The medicine immiticide…there is a shortage ….my vet has a waiting list….why has this shortage happened and when will it become available? I am so sorry for the delay in replying to your question. 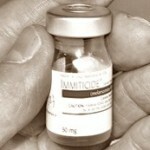 You will see that we have published an article about the Immiticide Shortage which I hope answers your questions. Thank you for contacting us. My 67 pound lab a dog we adopted from a shelter has heart worm. She has been treated with the immiticide 2 injections… she did not seem to show signes that the heatworms were in advanced stages although was positive. how long until I can take her for walks? should we give her heartguard for the larve? how long would you say until all of the heartworms die off? it has been 3 weeks since her treatment. Hi Brett, I wish I could answer all your questions but the truth is that whilst there are guidelines, every dog is different. The guidelines state that all dogs should be kept very quiet for the first six weeks after treatment. This means that even when you can start walking her, this should be on the leash (no running or jumping or anything that would drive up the heart rate). Yes, you definitely should put her on Heartgard or a similar monthly preventative but only when your vet has determined that it is safe to start this. With regard to the time period when she will be completely free of heartworm, residual heartworm (i.e. a dog testing positive for heartworm six months after treatment) is not uncommon and it is a topic that we are currently researching for an article for this site. As it is now three weeks since her treatment and you by the questions you are asking, she does not seem to be unwell at the moment, I think you can be quietly confident that she has come through the worst part and will continue to improve. It is vital though that you continue to keep her quiet until your vet advises otherwise and that you start her on a preventative when your vet recommends this. Hi Brett, as may know we are trying to build up a library of information here on heartworm treatment for dogs and are asking readers to submit their heartworm stories which we turn into a post and after gaining approval from the person submitting it, we post the article and send them $10 via paypal as a small thank you. If you would like to tell your dog’s heartworm story, I would love to publish it here. Just let me know and I will send you my email address so you can send me details. Hope your dog continues to improve we used to have a lovely Lab x Collie who was a treasure! We live in Tenerife with our lovely, golden retreiver cross, “Rambo”. My dog, who has never growled at, or bitten anyone in his life was poisoned last July. His life was saved by two quick-witted neighbours who raced us to the nearest vet and phoned ahead with the symptoms. The blood test which confirmed the organophosphate poisoning also proved positive for heartworm and he started treatment today. He is currently lying on his bed grunting in discomfort and looking very sorry for himself. He seems to be feverish, but the ambient temperature has suddenly risen abnormally high as a tropical storm is on the way. Your website has been invaluable. Thanks. We just adopted a dog. She is 2 and of course I took her to the vet to do the once over well check, rabies, provo, shots, etc. Found out she has heartworms. The vet is suggesting surgery then follow up with the Immiticide after surgery to get the ones in the bloodstream. My questions are; 1) How do you know how many heartworms a dog has from a blood test? 2) Is there any other test that is available that can give a more accurate read on how many a dog may have? 3) Can you just give the Immiticide treatments for the lower population of worms if it’s possible in finding out the population? I am asking this because I certainly do not want to put my dog thru surgery if it is really not needed. I am not trying to be cheap in anyway. I want what is best for my dog and the least invasive the better in my opinion. Please help? I believe it is normal for the vet to do x-rays to determine the worm burden in the heart and surrounding blood vessels. Surgery is not usually recommended unless the worm burden is very high. If this is the case, it might be dangerous to use the Immiticide treatment without surgery first. If your dog has not had x-rays and/or echo cardiograms to determine the extent of the worm burden, ask your vet and if necessary, get a second opinion. Hope this helps a bit – please let us know how she gets on. I have a 60 lb. mixed breed (probably some sort of lab / pit bull mix), 3.5 year old, female dog who recently tested positive for heartworms, even though she was on the monthly Heartgard preventative for the past 3 years. She has now received 3 injections of Immiticide (1st shot, wait 4 weeks, 2nd shot, wait 24 hours, 3rd shot). I find it very difficult to keep her calm 24/7, since she is a high energy dog. She gets especially riled up when I get home from work and let her out of her carrier. Do you have any suggestions as to how I can keep her from getting excited for the next month or so? Hi Doug, sorry for the delay in replying to your question. In addition to the information on this site, you might find this article helpful for tips on keeping your dog calm and quiet. 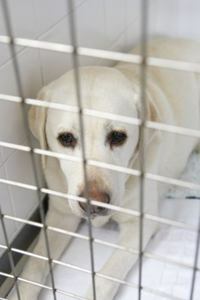 http://www.veterinarypartner.com/Content.plx?P=A&A=1716&S=1&SourceID=47. My own tip would be to talk to her very quietly when you come in, sit down beside her cage and talk to her gently, maybe offering a few small treats. Do not let her out of the cage until she has got over her initial excitement at seeing you – even if this takes a little while. With regard to the restarting of the Heartgard medication, your vet needs to be sure that the treatment to kill the adult worms has been successful before putting her on a preventive program. Update: Doug, I didn’t feel that my reply sufficiently answered your question, so I asked our researcher, Jenny to provide a more comprehensive response. I hope you find it helpful. Caring for a dog undergoing heartworm treatment is a challenge many dog owners face. While it is important to keep you dog calm, it is virtually impossible to prevent your dog from becoming excited when you come home from work. However, you don’t need to worry too much as long as you can calm your dog within a reasonable amount of time. It is important that you limit your dog’s physical activities while undergoing heartworm treatment. These activities are limited to running and playing. While your dog’s heart rate will increase due to the joy she feels because a member of her pack has returned home, the heart rate will not remain elevated once she begins to calm down. When the heart begins to pump too fast, heartworm fragments can be expelled too quickly and may cause complications. It is unlikely your dog’s heart rate is pumping as fast as it would if she were running or playing for a significant amount of time. Since she is a high energy dog, being confined may cause her to become anxious. Try putting a t-shirt you have worn in the carrier with her. She will be comforted by your scent and may feel more relaxed throughout the day. When you come home, make sure you talk to her in a soft voice while holding her gently. Since you must restrict her activities, try taking her on walks to expend some of her excess energy. A walk at a steady pace on a leash, will not elevate her heart rate significantly and she will enjoy her time with you. If you feel she is still getting too excited, contact the veterinarian for recommendations. In many cases, veterinarians will prescribe a mild medication to keep dogs calm and relaxed during the long treatment period. Monthly heartworm treatments do kill the larvae. However, when a dog is being treated for adult heartworms, standard protocol requires an additional injection to kill remaining larvae in the bloodstream. The larvae develop in stages before coming adult worms, and to ensure all larvae are destroyed regardless of the lifecycle stage, a final injection must be given. Once your dog completes the entire heartworm treatment, the monthly preventative treatment can commence. Hi Kelli, thank you for your comment. I believe we have covered aspects of this topic in our article heartworm resistance which you may find helpful. There do seem to be some very rare instances where preventative treatments fail which is why we published our article why you should always get a heartworm test when changing preventatives as a result of Doug’s story about his own experience with his dog, Ginger. We adopted a very sweet, male boxer who is heartworm positive. We are going in to the 4th week of post-treatment recovery (2 shots of immiticide on 2/16-17). We have noticed that occasionally he seems to vomit a small amount of bile first thing in the morning, after getting up. However, it hasn’t been happening daily. He did so again this morning — 2 small amounts and in the 3rd amount, which was a little more bile, we also noticed a little blood. After cleaning it up and about 1/2 hour going by, we gave him a little breakfast (a little of his dog food with one cooked egg in it), and he ate just fine. He has not thrown that up, so far. Is it normal for this to happen when the dog first gets up and should we be concerned about the tiny bit of blood that came through in the 3rd occurrence? Thank you. Sue, I am publishing your comment so that perhaps another reader who has had a similar experience with their dog will add a comment here too. I would say not to be over concerned, however any blood in vomit should be checked out by your vet as it is a sign of irritation within the intestine – this is probably due to him retching on an empty stomach but your vet will be able to advise. So glad to hear that he has had treatment and you are obviously taking great care of him – please ring your vet and get the reassurance you need. I just adopted a Golden Retriever/Chow mix and he tested positive for heartworm. Thankfully the rescue group I adopted him from has a vet (not the one I go to unfortunately) they work with and they agreed to cover the cost of the Immiticide injections. However my question is, is it normal for the dog to be sent home without any pain medication? I have a call out to my own vet to see what she recommends but I was curious if you knew what the “norm” was for post injection pain management. I’ve found your website to be very informative. Thanks for putting the information out there! Hi Richea, thanks for leaving your comment, what a lovely mix – Golden Retriever/Chow – I can just picture him in my mind! Certainly pain relief is not in the new AHS guidelines and you may already have read our article on the dangers of Aspirin and heartworm treatment. It would be interesting if you could let us know what your own vet advises. Thanks for your kind comments on the site, Jenny and I have worked pretty hard putting it all together and checking and rechecking the information! Hi Judy, heartworm is definitely becoming more prevalent nationwide and mosquitoes are out earlier than usual in many states this year. Guidance is that there is no evidence of heartworm resistance – the link takes you to the article we published back in April 2011. That was very unfortunate for your black lab – I do not have any statistics for the percentage of dogs that need a second round – I will ask Jenny to do some research on this topic. So sorry to hear that the new addition to your foster family is feeling really down – it’s hard to know what to advise – I am posting this so hopefully some other readers will chime in here? All the best to you Judy and it’s wonderful work that you do. We adopted a rescue dog (Wire Hair Fox Terrier) who had been heartworm positive and had undergone the treatments for heartworm during the year he was in foster care. We have had him now for about a year and give him Heartgard on a monthly basis. Ever since we’ve had him, he has had a cough but lately it seems to have gotten more frequent. He coughs until he brings something up and then he’s okay for awhile. His chin trembles during these coughing episodes. If he gets excited or has alot of exercise, he will cough. Could this cough be related to heartworm? Pam, thank you for your comment and glad to hear you are giving your little dog a monthly preventative. I am sorry that it is just impossible to say whether this cough could be related to his earlier heartworm infection – only your vet could tell you this. It could be something completely treatable and simple to fix so it would be well worth mentioning this and even videoing your dog’s coughing spasm after exercise if you have a cell phone that can do this and show the result to the vet at your appointment. Sorry we could not help you with an answer – but it would be great if you could update us when you have had a diagnosis. I have a huskey mix that has just started heartworm treatment. Shots were given 4/23 and 4/24. I am honestly very nervous about trying to keep her calm for the next couple of weeks. Your website has provided me with useful information. Thank you for that. Right now it is easy to keep her calm. My concern is how she is going to be 3-4 weeks from now. I am thankful for my family that is all chipping in to help her get through this. My vet is going to give her oral treatments after a month. Is that to kill the larvae in her bloodstream? Hi Lynn, great to hear from you and so glad that you have found the information on our site useful. I can understand your concern about keeping your dog calm – it is great to hear that everyone is lending a hand, yes you are right about the oral treatments and at this stage, your vet should be able to allow her exercise to be increased so she can get some good walks on the lead and use up some of her energy. All the best with her recovery and as you know, our dogs pick up on our thoughts and worries, so you staying calm and positive is certainly going to help her. my dog was just diagnosed with heart worms,but they gave him doxcycline 100 mg for 2 months and then they will start treatment for the worm.he said this stops anymore from producing.he did not have an xray will they give him one before he starts. Hi Dolores, I hope your dog’s treatment goes well – you might find our article which explains about treatment with Doxycycline helpful. Our dog, a 29lb 4yr old Shiba Inu, was tested for heartworm in April and it came up positive, was determined a Class 1. Unfortunately, we were on vacation and he was boarding at the vet so all was done over the phone. Our vet said she would treat him with the Immiticide in two shots 24hrs apart(18th and 20th). When we came to pick him up they gave us the heartworm preventive med and I asked when to start and was told immediately so we gave him his first pill on the 21st. He has had a second in May. Now, for the problem, on April 25th, he was acting “drunk”, very off balanced and his eyes seemed glassy to me (and had been for a couple of days, they just seemed off). He came out of it but we took him to our local vet (our regular vet is 5 hrs away) the next day and she took xrays, which looked fine and said he probably had a mini stroke. But as he was fine at the time she prescribed him a week of Rimadyl for inflammation and pain. Then a couple of weeks later, May 14th or 15th(I didn’t note it because at first, until today it didn’t seem connected) my mother was letting him out of our pickup in the garage where he stays when we are gone to the store and his head was down like when he has done something bad and so she looked for a mess in the truck but there wasn’t anything, and then he was fine. But she also noticed his eyes were squinty, since I didn’t see I I assumed he was just waking up from a nap. He also wouldn’t get right out of the truck and we thought it was because Mom isn’t the one that usually lets him out. But because of today, I am almost positive he had another “mini” stroke, as the vet put it. Today, he again was acting drunk, crossing his front legs when trying to walk and his right eye was squinty. He sat on his haunches and would lift his right paw then his left, like they hurt or something. I went to the local shelter to adopt a dog. She is 2 years old and only about 29lbs Rottie. They wouldn’t let me take her home because she is Heart worm positive. They said she is on a waiting list to see what stage she is at 1,2, 3 or 4. They said if she is at 4 they will just put her down, but at 1, 2 or 3 they will call me and let me know. Unfortunately she is last on the waiting list to be tested and they will not bump her up even though I she has a home waiting for her. My question is, depending on the stage, what is the average cost of heart worm treatment that I am looking to incur? Also are there long term side effects that may cause her quality of life to be compromised?. She bonded quickly to my daughter and I and I want to give her a fighting chance to a good and safe life. We live in Fiji now and brought our (now 7) year old German Shorthaired Pointer with us. He has always been on Heartguard. After 1 year our US vet said he could no longer give us medication as he had no way to do yearly follow up screenings. Long story short we purchased a product from the SPCA in Suva called: ProHeart. Recently Buddy started coughing so my husband took him by ferry to a private vet in Suva (as we do not have any vets on our island). She was trained in Australia and seems very knowledgeable with good diagnostical equipment. Testing for heartworm came back positive and xray revealed slight pulmonary congestion. She thinks we got a bad/close to exp. batch of prevention as most of the meds SPCA carries are donated meds. (which we did not know when purchased). Buddy starts tomorrow with Immiticide therapy. 1 injection followed up in 1 mo with 2 injections 24 hours apart. I have been investigating heartworm treatment on the web and a couple of the sites suggest using aspirin as a anticoagulant to help prevent worm embolism possibility. Do you agree with this? We have low dose enteric coated aspirin on hand (81mg) but not sure what dosage advisable. Our dog weights 39kg/ about 85lbs. If this is advisable therapy who much and how often should we administer? My husband also wonders for the ferry trip back to our island(as it is a over night trip) if the dog should be given a lite tranquilizer to keep him less stressed. He plans to take the dog up to the cabin by elevator where he will then be housed in his crate. He will only need to walk from drop off inside the boat to the elevator and then a short distance to cabin. Sites also suggest giving a antibiotic and anti-inflammatory? Should we make sure to get that as well? Any advise you can offer would be very much appreciated. Hi there! Thought I would contribute my story to your collection! I’ve never had to deal with heart worms till one month ago. should be. Dr recommended first injection with a 24 hour stay. He did very well. Hi Julie, thanks so much for sharing your dog’s story – I hope he is doing better now. Keep us posted!